ON SALE! As low as $34.95 a box! 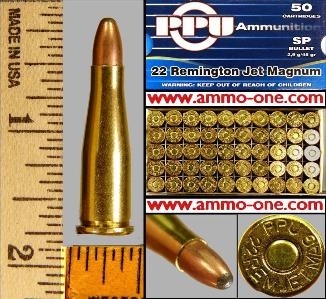 22 Remington Jet Cartridge History: The .22 Remington Jet was introduced by Remington for the Smith & Wesson revolver in 1961, followed by the Marlin lever action rifle, H&R rifle and Thomson/Centerfire. It was based on a .357 Remington Magnum case necked down to a .22 caliber case. Production stopped in 1971 due to Smith & Wesson discontinuing of the revolver due to cylinder lock up problems.